The Rev. Dr. Christopher R. Smith is a writer and biblical scholar who is also an ordained minister and served local churches as a pastor for nearly twenty years. He was a consulting editor to the International Bible Society (now Biblica) for The Books of the Bible, an edition of the Scriptures that presents the biblical books according to their natural literary outlines, without chapters and verses. His Understanding the Books of the Bible study guide series is keyed to this format. He has an A.B. from Harvard in English and American Literature and Language, a Master of Arts in Theological Studies from Gordon-Conwell, and a Ph.D. in the History of Christian Life and Thought, with a minor concentration in Bible, from Boston College, in the joint program with Andover Newton Theological School. Dr. Smith answers questions about the Bible, particularly those that arise from the use of his study guides, at goodquestionblog.com. In my last post I explained why I believe God wanted Priscilla and me not to make direct appeals for support, but instead rely on Him to provide through prayer, when we were volunteer campus staff members with Graduate InterVarsity (Grad IV) at Michigan State. But how were we led to follow that approach in the first place? I was expecting to move into another full-time salaried position when I left my pastorate in East Lansing in 2008. Over a period of many months I applied for a variety of teaching, chaplaincy, and pastoral opportunities all over the country. But this widespread job search did not yield even a single interview! At the same time, however, two other things were happening. First, the dozen or so graduate students who’d been attending our church asked us to work more closely with them in Grad IV because their staff member had just left. And so I helped lead the group’s Bible study that summer, and we worked closely with the student leaders to plan that fall’s New Student Outreach (NSO). We realized that we wanted to keep working with this group for as long as we were in town, and that in that case we really should come under the authority of InterVarsity. So we both applied to become volunteer campus staff members and were accepted. Eventually it dawned on us that we likely weren’t going anywhere in the near future, but that this was all right, because we had a ministry that we really enjoyed, and the means to carry it on. I remember telling God in prayer one day, “You’ve got yourself a deal. As long as we’re able to keep doing this, we’ll keep doing it.” My measurement of whether we were able to “keep doing this” was a bookkeeping account I initially named “Survival,” but later changed to the less dramatic “Living Expenses.” So long as it remained in the black, I felt, we were good to carry on. And it stayed in the black the entire time we were volunteer staff, at least on an “accounts receivable” basis: On the few occasions when it dipped into the red, this was never by more than the amount I was owed for freelance work already done and payable. I should specify that when it came to funding our ministry with Grad IV, we didn’t feel that God had forbidden us to ask directly for support. Rather, as specific needs arose, time after time we felt a positive leading to pray and wait for God to provide for them in a way that would also serve the larger purpose I described last time. We believe that God is honored when His great works are made known, and so we’re looking for people to share the latest news with about what God is doing among the graduate students at Michigan State University. Please let us know if we can send you prayer requests and ministry updates. We’d be honored to have your partnership in our ministry in this way. Also, as volunteer staff we’re donating our time, but we can raise support for expenses such as travel, supplies, and conferences. We’re both hoping to attend InterVarsity’s Following Christ conference in Chicago at the end of this year. If you would like to support our work in this way, please let us know, and we’ll tell you how you can. Thanks very much! Other than this, all five years of newsletters contain almost nothing on the subject of financial needs except grateful reports that we’d finished the calendar year or the school year “in the black” in terms of both ministry expenses and living expenses, and invitations for our friends to rejoice and thank God with us for this. The one exception comes in August 2011. Priscilla’s desktop computer had stopped working and it would have cost almost as much to repair as to replace. My laptop computer was ten years old at that point, and while it was still going strong (those iBook G3s lasted forever! ), it could no longer keep up with the latest browsers and so I was unable to use essential student ministry tools such as Facebook and Google Docs effectively. But even though we made this direct request, God still provided for this need in a way that spoke of His reality and present activity. We soon did receive one generous check from friends of our ministry in response to this appeal. But the next day we received another check that had been written before we made the appeal! Three days later a local friend brought her brother, who was visiting from out of town, over to meet us. After a great visit they said their goodbyes and left. A few moments later the doorbell rang. It was the brother. The look on his face said, “You’re probably going to find this strange, and as a matter of fact, I’m finding it a bit strange myself.” But he had returned because as soon as he’d gotten into the car, he’d felt God leading him to make a gift to our ministry. He didn’t know about our need for computers. But he nevertheless gave us a contribution that made the total in our computer fund sufficient for us to purchase a desktop computer, particularly when we followed our InterVarsity supervisor’s advice and got a refurbished one online at the Apple Store. Later a friend who served with a Christian ministry was given a computer upgrade at work and he was allowed to donate his previous laptop to us, because we too were in ministry. In my first post I noted that before Priscilla came down with her illness, we’d been led “into a way of life that involved trusting God by faith to provide for our needs.” It will be helpful to explain more about this here, before I tell the full story of how God cared for her during her illness, because this will account for many of the things you’ll be hearing about. When a follower of Jesus feels called by God to pursue an enterprise for which they don’t personally have sufficient funds, the normative practice, to state it bluntly, is for them to ask for money. More specifically, they will contact people they believe would be interested in their work and explain how it is strategic for advancing God’s kingdom; they will describe the financial and material needs it currently has; and they will invite people to become partners in their enterprise through prayer, encouragement, counsel, and particularly by giving towards those needs. So this is the norm. But sometimes, under exceptional circumstances, God calls people who are in need of money for a kingdom initiative to take the first step in this process, but not the second, and the third only somewhat. That is, they may still explain to interested friends what work they feel called to and outline its strategic importance. But they will not describe its immediate practical needs, and while they will still invite others into partnership with their enterprise through prayer, etc., they will not ask them to contribute towards those needs. Instead, they are to trust God to put it on the hearts of friends of the work to do this at just the right times. Because this approach is so exceptional, it must be taken only for specific and suitable reasons. For example, when Hudson Taylor went to work in inland China in the mid-19th century, he recognized that he would have to count on God to lead his supporters in England to send him money weeks or months in advance, even before he knew of needs himself, so that it would arrive in China by the time it was needed. Francis and Edith Schaeffer took this approach in the l’Abri Fellowship because they believed it would help them demonstrate the reality of God to the young inquirers and atheists they wanted to reach. And Amy Carmichael did it very often as a matter of guidance. When the Dohnavur Fellowship was contemplating a new undertaking (such as building another nursery), its members would pray that if God was behind this initiative, He would put it on someone’s heart to give towards it without them asking—as happened repeatedly. I’ll describe in my next post how God called Priscilla and me in 2008 to become volunteer campus staff members with Graduate InterVarsity Christian Fellowship (Grad IV) at Michigan State University. But let me explain here why, I believe, we were also called to follow this exceptional approach to meeting the needs of that ministry. At the time, we understood that we were to do this pretty much for the same reasons as the Schaeffers at l’Abri. As God provided for us not through direct appeals but instead through trust and prayer, this would help believers, seekers, and skeptics among the students we were working with, who were looking on, to recognize God’s reality and activity in our world today. Many students shared with us that this indeed happened for them. But now that I look back in light of more recent experiences, I feel I can discern an additional purpose. I believe that God also wanted us to follow this approach to funding our ministry with Grad IV so that we would already be doing it when Priscilla became ill and we could no longer be active in that ministry. That way, as she continued to receive help in this same way, as her heavenly Father put it on the hearts of compassionate friends to provide it at just the right time, and as God orchestrated all the other aspects of her care with what I’ve called “an intimate concern for every detail,” this would illustrate to everyone looking on that a person who gets a terminal illness, even a protracted, severely disabling one like ALS, is never forsaken by God. Buildings on the Dohnavur compound. The Fellowship typically only started construction on needed buildings after praying for and receiving what they considered a “sign gift” towards their costs. The master plan for our renovation was first to move the furniture from Priscilla’s office into mine so we could rip out the carpeting and put down wood floors. We’d then move our bedroom furniture into her empty office and change the bedroom floor. After putting that furniture back we’d move the combined office furnishings into Priscilla’s office, redo my floors, and finally put my office things back. The only problem was, each of the rooms was so full of accumulated stuff that it couldn’t accommodate anything from the other rooms. So when our nieces arrived a week after the church cookout, in addition to having some great social times with us, they spent many hours with Priscilla “sorting and purging” (as she put it). I brought two car loads of donations—trunk full, back seat and front passenger seat piled almost to the roof—to thrift stores. We sent further quantities of things home with our nieces when Priscilla’s sister came to pick them up. She helped quite a bit herself with the “sorting and purging” before they all left. Our nieces also helped me carry inside the half-ton of wood that was delivered to our driveway a couple of days after they arrived. It needed a week or so to adjust to the temperature and humidity of our house before being installed. The boxes of wood were eight feet long and there were twenty-four of them. We stacked them in three tall piles in our front room. There was no denying that this was really happening. The day after our nieces went home, another friend arrived. She helped me move all non-essential furniture out of the renovation area and down to the basement. She also helped me move the remaining furniture from Priscilla’s office into mine, creating our first open room. Families from our church signed up to bring meals for our whole crew almost every night they’d be here. A young man in the church volunteered to come each day and help us move the furniture. This was very helpful, since the job included moving the hundreds of books I had in four large bookcases out of my office and then back in again. The day before our workers arrived, we heard from some longtime friends. They did not know that we were going ahead with the floor renovation at this time. But they told us that God had put Priscilla’s situation very much on their hearts in recent days, and that after considerable thought and prayer, they had felt led to give us a gift of a certain amount. It was a very generous gift, one that would cover all the anticipated costs of the floor project! There would likely even be something left over for another renovation we needed to do as soon as possible, making our master bathroom barrier free. We set three goals for the week Priscilla’s two brothers (along with one brother’s wife and son) would be with us. We wanted to finish the project by Friday evening, since everyone would need to head home by Saturday. We wanted no one to get hurt. And we wanted to have no major disagreements about how to proceed as the project developed. The job was finished in the early afternoon on Thursday, in safety and in harmony. One brother took the opportunity to go thrift store shopping later that day and found an excellent wheelchair for $30. The previous evening Priscilla herself had visited local thrift stores with her other brother and his family and they’d found a transport wheelchair (fold-up, with small wheels) for $21. We’d been looking at both kinds of wheelchairs and thought we’d have to pay hundreds of dollars for them. But much more importantly than these great deals we got, how wonderful it was that Priscilla’s brothers could make an ongoing contribution to her care by helping her acquire this equipment that she would shortly need to use on a regular basis. The vinyl armrest covers of the transport wheelchair were cracked, so the brother who helped find it gave Priscilla a “leather upgrade” by making and installing new covers from some black leather she had. I’d finished my last freelance editing job on the day the wood was delivered. But the night before we finished the renovation, a client contacted me about another job he hoped I could start soon. I’d been made available to help full time with the floor project for as long as I was needed, and now God was sending me more editing work. On Saturday, after we’d sent the last of our workers off with our love and profound thanks, we got an email from some other longtime friends. They also didn’t know we were doing renovations at this time, but they too said they had been led to give us gift. It was another a very generous one. Between it and what was left from the earlier one, we were well on our way to having enough money to renovate the master bathroom as well. This whole experience is typical of the way God cared for Priscilla throughout the 4½ years she fought so courageously with ALS, and so its story makes a fitting overture to this blog. I don’t know why she had to suffer so terribly from the disease and finally die from it. But I do know that God never abandoned us. I want to tell you the full story of those years, because I want you to witness, as we did, how God walked through them with us, showing an intimate concern for every detail of Priscilla’s care. So please join me for the posts ahead. I want you to see that God’s mercies to Priscilla didn’t end when she get an untreatable fatal disease. God’s mercies are endless. And speaking of concern for detail . 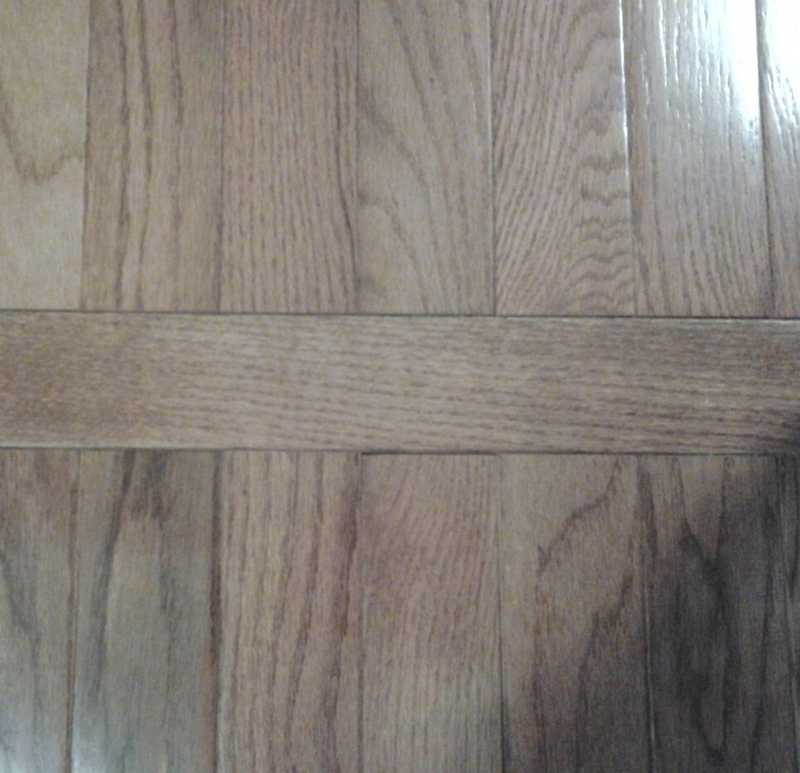 . . our craftsmen ensured that the new floorboards (top of photo) lined up perfectly with the old ones (bottom). It was June 2013. My wife Priscilla had a still-undiagnosed condition that was causing weakness in her muscles. This had started in her legs but was moving steadily up her body. Already she needed to use a wheeled walker to get around, and we suspected it would only be a matter of time before she was in a wheelchair. Mercifully we had a ranch-style house and our bedroom was on the ground floor, but it was carpeted, as were the rooms we used for our offices. It was hard enough for Priscilla to use the walker on these carpeted areas and we knew that using a wheelchair would be even harder, especially as her arms lost strength. We’d thought about moving to a handicapped-accessible house or apartment, but we’d realized that we already had our hands full managing Priscilla’s ever-progressing symptoms. Sorting through all our things, packing up, and moving, not to mention selling one place and buying or renting another, would simply be too much for us. So we’d resolved to make our stand right where we were and somehow replace those carpets with hardwood floors. But first things first. Priscilla loved to entertain, so when our church announced it was looking for hosts for a series of midweek summer cookouts they called “Jesus Parties,” we were the first to sign up. On the evening of June 5, 2013, we welcomed over 50 people from the church for a backyard cookout. Because of her new limitations, Priscilla delegated many things she would previously have done herself, gratefully accepting when friends offered to set out tables and chairs, and sending helpful volunteers into the house with directions to needed items. Around 8:30, when everyone had finished eating but before most of the guests had left, it began to rain. Everyone grabbed the nearest table, chair, or dish and hustled everything into our house or into their cars, and they all drove off. Alone back in the house, we discovered we had a phone message. Two of our nieces had called during the party to say they wanted to come visit us for several days—starting the next week! Priscilla realized they were just the people to help her sort through enough of our things to clear the way for the renovations. So she gladly arranged for their visit. That same night she emailed one of her brothers who had offered to come for a week in July to help us pack (the last he’d heard was that we were thinking of moving), to see whether he’d help us put down wood floors instead. He agreed, saying he’d never done that before but thought he could learn. He explained that July would no longer work for him and asked whether he could come starting June 23! So Priscilla emailed another brother, an experienced woodworker who had earlier helped us put down the wood floors we had in the rest of the house, and who’d already been consulting with us on approaches to renovation, to see whether he could come at that time. He replied that he could, since his company allowed its employees to take time off to help a close relative, including a sister, who was sick. He added that while this would have to be time off without pay, the week of June 23 included a statutory holiday in Canada where he lived, so we’d only have to replace four days’ salary for him instead of five. His company would pay him for the holiday. So the workers we needed were available. In the previous few years we’d been led, for reasons I’ll explain in later posts, into a way of life that involved trusting God by faith to provide for our needs. One principle we’d learned over those years was that if we discerned by faith that God was sending workers for a task, we could also have faith that God would provide the money and supplies required for that task. Between salary replacement, equipment rental, and the wood we’d need for three rooms (this was the bulk of the expense), the cost of the renovation would be over $3,000. We had nothing set aside to cover this cost. But given the way everything had come together right after the cookout for the project to begin two and a half weeks later, with preparations to begin in just a week, and especially given our conviction that Priscilla’s heavenly Father loved her and was showing that He wanted to take care of her, we stepped out in faith. We ordered the wood.